Which Body Contouring Procedure Is Right for Me? | Thomas Taylor, M.D. Just about everyone wants a slim figure. A person can try all types of diets and crazy exercise routines to lose weight and tone their body, and though some people are successful in creating a thinner, better-contoured physique with diet and exercise alone, others find that losing those last few inches is nearly impossible. Plastic surgery is an option that comes to mind when someone wants to eliminate fat and tone their body. However, with so many options, it’s hard to know which body contouring procedure is the best for you. Depending on an individual’s goals and the severity of correction that is required, he or she may undergo one or more body contouring procedures. When diet and exercise seem to fail, liposuction may be the perfect procedure for removing fat and toning your body. As one of the most popular plastic surgeries, liposuction helps a person achieve a more slender body contour. In performing liposuction, Dr. Taylor utilizes the time-tested tumescent technique, where an injection of a tumescent solution is used to break up fat before its removal. The fat is then gently removed using a cannula with the power-assisted technique. More and more people are requesting non-surgical plastic surgery options. Among the latest techniques is CoolSculpting®. Patients who have fat that they would like to target but are apprehensive about surgery may be more suited for CoolSculpting®. A safe and non-invasive procedure, CoolSculpting® is designed to remove fat naturally with the use of controlled cooling to target and crystallize fat cells. This is done in an office setting while sitting comfortably in a recliner bed or chair. There is no recovery at all, and patients may resume normal activities immediately after the procedure. Pregnancy, weight fluctuations, and aging can all take a huge toll on the body, especially the abdominal area. The aftermath of these life events may be excess fat and loose, hanging skin on the abdomen as well as weak abdominal muscles. Tummy tuck surgery is used to surgically excise fat, skin, and tissue that causes the abdomen to pooch out; additionally, this surgery tightens stretched-out abdominal muscles. Liposuction may also be used to target surrounding areas, such as the love handles and back, for optimal results. Patients can achieve a firmer, more toned abdomen with results that will last for many years. Fat and skin in the arms can be unflattering and embarrassing to expose. 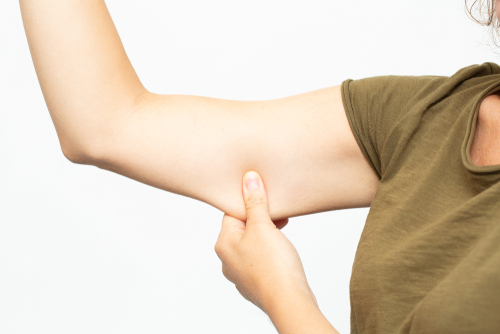 Many people who have loose skin and excess fat deposits in the upper arms avoid wearing revealing clothing. Patients who want to get rid of a flabby arm appearance may be wondering if they can treat their problem with just liposuction. And if a patient only has fat to target, then liposuction may be an ideal option; however, if they have sagging skin, extra tissue, and fat, then they may need arm lift surgery, also known as brachioplasty. Arm lift surgery involves an incision on the underside of the upper arm. Excess skin and fat are removed, the remaining skin is redraped over the arm contours, and sutures are used to close the incisions. Patients who have excessive amounts of fat to be removed may combine an arm lift with liposuction for the best results. Another option is to use BodyTite™ for the arms as it is a new technology that uses radiofrequency heat and energy to tighten the skin. This is a minimally invasive procedure that provides skin tightening to the arms without the scars. Patients who need to remove large areas of fat will benefit most from liposuction. Liposuction is also more suitable for patients looking to add definition or improve their body contour. CoolSculpting® is designed for patients who only require minimal correction for common problem areas. And while CoolSculpting® eliminates fat, specific areas cannot be controlled as well as with liposuction. However, CoolSculpting® is the perfect procedure for patients with small treatment areas who do not want a lengthy treatment and recovery process. These patients usually have busy lifestyles and cannot devote the proper time to a full liposuction recovery. Patients with abdominal fat, loose skin, and stretched out tummy muscles are best suited for an abdominoplasty procedure, which corrects all three problems. It is a bigger surgery in terms of recovery, but the results can be dramatic. Patients with loose skin and excess fat on their arms and those who have not responded to diet and exercise may be good candidates for an arm lift or BodyTite™ on the arms. Dr. Taylor will help you decide which procedures are perfect for you during your consultation. If you are interested in one or more body contouring procedures, contact us by phone at (626) 314-6476 or fill out our online contact form to schedule a consultation.